Most people that were interviewed prior to the start of forum had already decided who they are voting for. As candidates enter the final lap of their campaigns for the Alberta Provincial election, some are facing criticism for their lack of attendance at public forums. United Conservative candidate for Lethbridge-East, Nathan Neudorf sat out of the forum held by the Southern Alberta Council on Public Affairs (SACPA). When asked why he did not attend, he stated his reason was due to “another commitment”. He later added that he was attending other forums. Alberta Party candidate for Lethbridge-East, Ally Taylor, who lives in Calgary says she was not aware that there was a forum happening on the day of the Lethbridge-East forum at Lethbridge Public Library. She also did not attend the SACPA forum. Karri Flatla, United Conservative for Lethbridge-West was a no-show for both SACPA and Lethbridge Public Library forums. She told Bridge City News that her and her team are choosing to focus on door-knocking and one-on-one conversations. While it can be understandable for a candidate not to attend a forum due to scheduling conflicts, as there are 14 forums being organized by different groups and organizations, it is not quite clear why one would skip out completely in favour of door-knocking. The Lethbridge-West forum at Lethbridge Public Library was held the same evening as the Leader’s debate in Edmonton. Was Flatla door-knocking that night on Lethbridge doors to speak with residents who were at home to watch the debate? 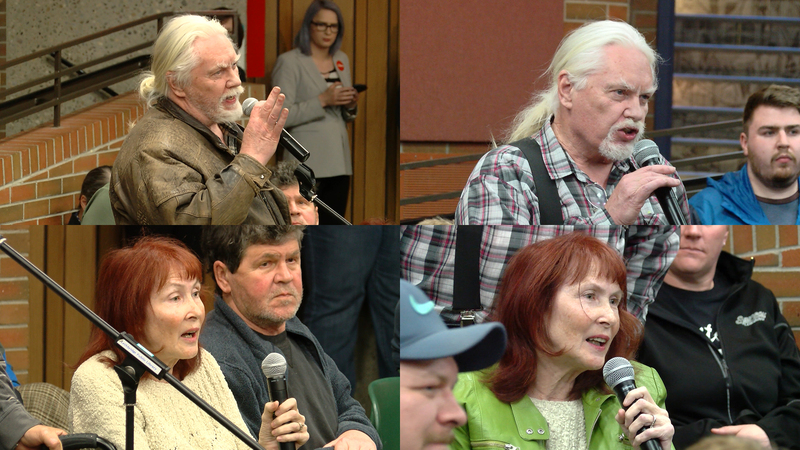 At the Lethbridge Public Library forums, we interviewed handfuls of people in attendance. Prior to the start of the talks, we learned that most of those we spoke with had already decided who they are voting for. They added that they were unhappy that some candidates chose not to attend. In fact, for both forums at the Library, the majority of questions from the audience were for the candidates not in attendance. So, why the no-shows? Why avoid being asked questions in front of the public? A possible explanation was in the audience. One of the audience members could not ask his question because of time limitations. He showed frustration that the time was consumed by other who asked questions that appeared to be “planted” in the audience by other candidates. It is not uncommon for candidates to plant supporters in the audience to ask questions that target their opponents. Some people attended both the East and West forums and were able to have their questions answered. One who attended both evenings asked a question that targeted Neudorf. The second event, he had a question for the “ghost candidate” (Flatla). The next day he was spotted checking and maintaining signs that were for an NDP candidate. Some attended both East and West forums and took opportunities during both Q and A times to ask questions. So, if the forums are being used by those who are already decided, how do the undecided get all of their questions answered during a limited time frame? And if candidates are not attending forums how can the undecided make a decision? There is no vetting process at these forums, and questioning one’s sincerity would be unconstitutional. Perhaps Flatla is not attending forums as a campaign strategy. Is good old-fashioned door-knocking still the best method of reaching out to the community? Will this work? We will find out on April 16th. The Lethbridge Chamber of Commerce will host an all-candidates (East and West) forum on Thursday, April 11 at 6 p.m. at ENMAX Centre. Bridge City News Director and Anchor, Hal Roberts will be part of the media panel.